Here's another fine A.J. 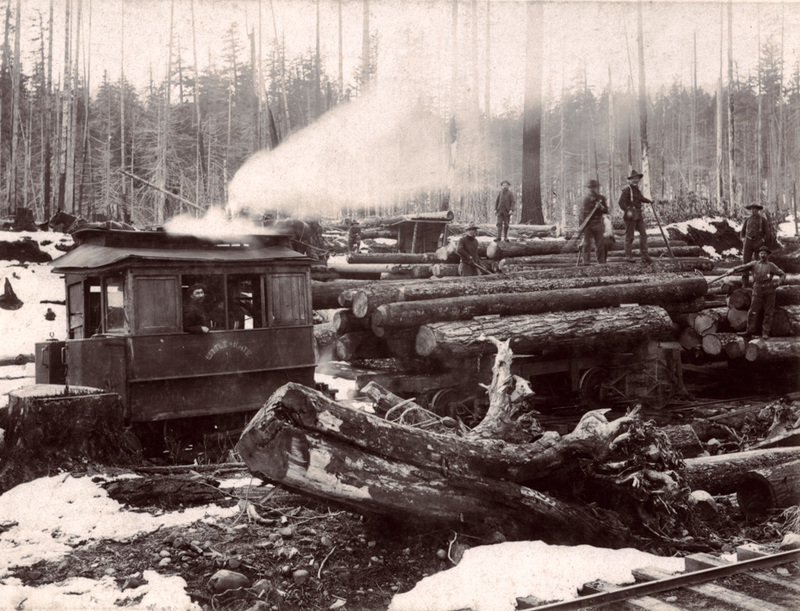 Shepler logging photo. We saw another copy of this image before, but this one is sharper and identifies some of the loggers. In additions to Mr. Shepler, we have Pete Young and "Coughenower". These Shepler images have been in our collection for a while, but I'm just running across them again as I clean up some of the metadata (keywords) associated with the digital image files. With so many images in our collection it's easy for some to get "lost" if they don't have appropriate keywords to pop up in a search. These had minimal keywords ("Logging Related") so they only came up in a very broad search of logging photos. Since the two copies were from different collections and only one mentioned Mr. Shepler, they weren't easily connected. This copy is an original print so the resolution and quality is much better than the one we saw earlier. Even with snow on the ground, loggers with peavies in their hands won't have to worry about staying warm. neat photo....looks like a small steam locomotive to me....where might this be? A lot of manpower to load logs in this manner. while the engineer waits in his very warm environment. The ties are mill cut, not as primitive as the engine, with no tie plates and about 30 pound rail. I've never seen a locomotive like this. How big is the engine? Where is it in this image? Seems they would use a wood burning engine but this appears to be an oil burner with two tanks, possibly for water and oil. I have this very same pic and on the back it says Mill A 1900 I have no one to ask but I would think maybe it could have been on the Washington side as the Dee mill didn't start up till 1905-1906 time. Lee, we have another AJ Shepler photo showing him at Mill A, so it's very possible. I think young loggers followed the work from mill to mill. Most young loggers moved on because the hot cakes were too round or the beds were too soft. Called them camp inspectors. Honorable occupation and the camps would hire them back if they were hard workers. When steam replaced horse cars on city streetcar lines, the running gear was concealed such as this to save scaring horses, called "steam dummies". Wonder if this is one replaced by electric in the city. When steel rails replaced cast iron in the city, logging lines such as Bridal Veil used the cast iron on Larch Mtn, where some full length rails remain today. Nice added content and contribution Kenn ! Wonder who Little Kate was? In the 1900 Census for Chenowith, Skamania County, there is listed a Theodore Shepler age 20 hook tender and Alfred J. Shepler age 18 timber faller. Willard Young, age 38 is a locomotive engineer. William Congermower, (Coughennower) age 39 is a locomotive fireman, married with 6 children. William died in 1903. His widow married a Whorlow from Hood River. Daughter Phebe Coughennower married Frank Howell from Hood River in 1915.